Rent this splendid flat in Prestigious Old Quebec; the heart of the old city and within the fortress walls. Nice and warm-hearted apartment ages back 270 years, cobblestone streets. Apartment includes 2 bedrooms, fully furnished, exposed stone walls, floor of frank wood and much more. Each bedroom has exposed stone wall and open to main area living room. Bathroom has tub/shower combination with large vanity. Washer and dryer available on basement level. Functional and fully stocked kitchen including dishes, pots, glasses. Roof top patio off kitchen. Excellent location for walking distance to all amenities and tourist attractions. Also including: cable, telephone and internet. Short or long term tenancy welcome. Louer ce magnifique appartement au coeur du Vieux-Québec. Faites vos courses à pieds ou en vélo! Ce charmant et chaleureux appartement meublé comprend 2 chambres à coucher ainsi qu’un plancher de bois franc, mur de pierres rustiques, et plus encore! De plus, nous offrons le câble, la ligne téléphonique et l'accès à l'internet. We live in the west and are 5 years short of retiring. We love to travel and adore the French culture although we do not speak French. The local people in Quebec are friendly and helpful and the food is amazing. I fell in love with this place because it closely resembles Europe. I visit once or twice per year and will make it my part time residence once I retire as it is getting harder to travel to Europe. We visit the local market daily located near the train station to get vegetables, meats and cheeses. We buy a fresh baguette daily across the street and sip at wine while we eat bread, cheese and pate. We enjoy the restaurants and local art. You will find basics including some spices, oil, flour, tea, coffee, foil & wrap from other guests. Access to patio off kitchen. Furnished with patio table and 4 chairs. Across street, you can purchase wine, beer, groceries including fresh baguette made daily. What a great place to stay and see the sights of Quebec! Beautiful apartment just as described and pictured. Spotless clean, warm and inviting. My daughter and I had a girls vacation and the apartment was perfect for us with comfortable couch and recliner, dining table and chairs, and 2 comfy bedrooms. The bathroom and kitchen were also perfect and well stocked and very clean. This was the perfect location with easy walking to the Frontenac, shops, restaurants, and funicular to lower town. St Patrick's pub was across the street, as well as a 'convenience' store with wine, beer, and a few groceries. Underground parking was within 2 blocks and very convenient. We also walked to the Market at the Port and picked up fresh groceries, bread, breakfast items, some cute clothes, and of course maple syrup. Patti made our stay even better with great tips on where to go, and timely communication. 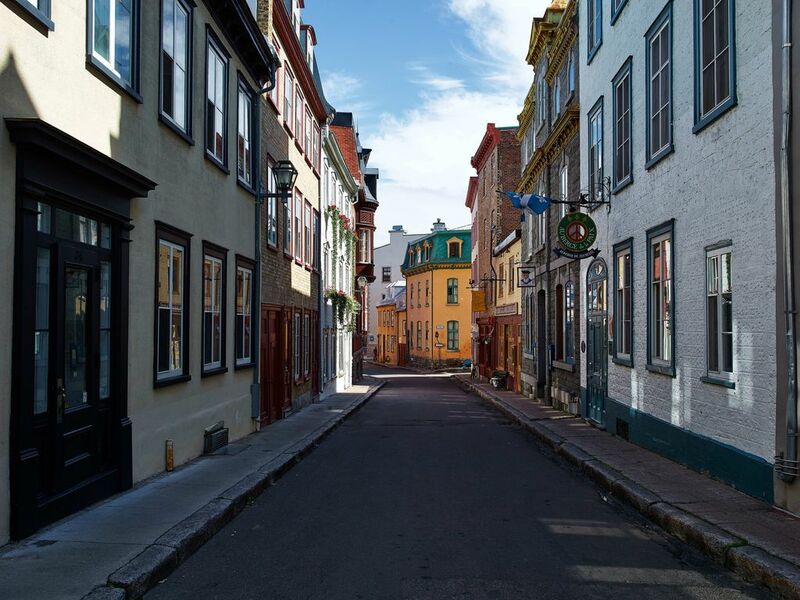 We would LOVE to come back and stay again and keep exploring Quebec City! You will not be disappointed with this rental and Patti the host was great! Thank you for such a great place to stay - it was perfect!. The apartment was well stocked, centrally located, very clean, and cute as a button. This little apartment was the perfect place for 2 days/3 nights in Quebec. We were right in the heart of the old City. The kitchen was very well stocked, comfortable beds, beautiful newly renovated bathroom with the best shower head ever! My only suggestion would be to add another comfortable chair in the living room as we were two couples staying and there was only seating for three. Thanks for the feedback - that is a great suggestion and glad you enjoyed your stay. Quality, charming, and a perfect location. Close to all that old town has to offer. Outdoor, city-wide New Years’ part was tremendous. Great skiing nearby too. Great location to experience Quebec City!! Lovely flat in a great setting...near everything so we could walk everywhere! Flat nicely appointed and comfortable. Cozy and comfortable for our family of four. Quebec City is extra beautiful during the holidays! The 3 of us so enjoyed our time at Christmas in Quebec City. The apartment is centrally located and has all the comforts of home. Property is located on Rue Couillard, just off Rue Saint Jean and just a 2 minute walk to Portofino's Restaurant and the shops of the old city. Rates may vary by season. Extended stay may be negotiated.